Coffee gets many of us going in the morning, but for a couple of engineers in the UK, it also gets their cars going. The Coffee Car is a car that runs on used coffee grounds. It is powered by a process called “gasification,” which converts carbon-containing substances – such as roasted coffee beans – into energy that powers the car. It is relatively clean energy, in spite of the puffs of smoke that arise from the car while it is in action, since it is reusing a product that might otherwise go to waste. That said, the car does take quite a lot of coffee to get going: it is said to travel about 55 miles on the power of a 22-pound sack of grounds. 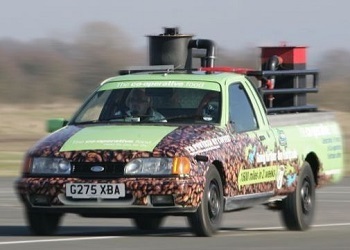 The Coffee Car set a 65.5 mph Guinness World Record for the fastest coffee-powered car last month. Admittedly, it probably isn’t that competitive of a category, but still an impressive speed for something that is usually only considered to be a tasty beverage. So, coffee grounds probably aren’t going to be the fuel of the future, largely because coffee is still a pretty pricey product and there wouldn’t be enough grounds to go around for huge numbers of drivers. But it is amazing to see how inventive people can be and how surprisingly versatile coffee can be!